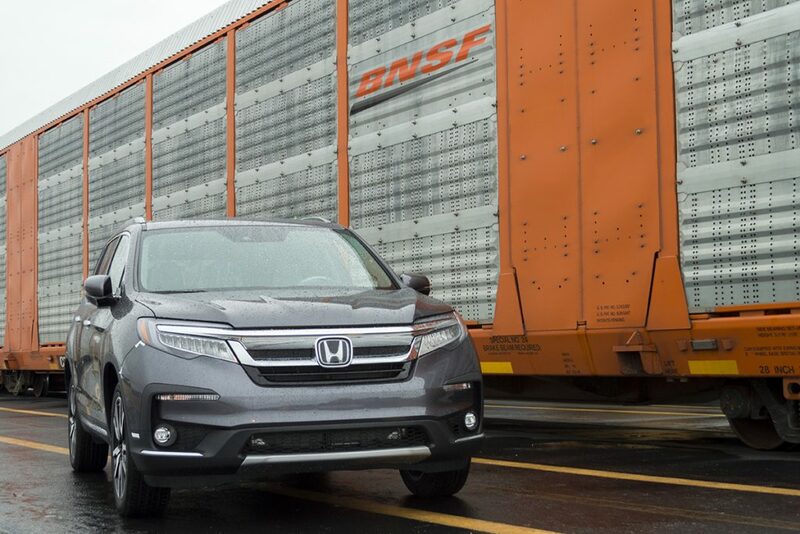 FORT WORTH, Texas, September 26, 2018 – BNSF Railway Company (BNSF) was recently honored by Honda for excellence in transportation. American Honda Motor Co., Inc. President and CEO Toshiaki Mikoshiba presented the company’s annual Premier Partner Awards to 15 suppliers that demonstrate excellence in quality, value and customer service. BNSF was recognized for efficient and reliable railway transport of finished vehicles. The Premier Partner Awards were established in 1998 to recognize suppliers who embrace Honda’s philosophy of exceeding customer expectations. The award winners represent excellence in a variety of industries including automobile batteries, railway transportation, information technology services, marketing services and much more. Earlier this year, Honda celebrated its 25 millionth automobile built in the U.S. at its Ohio-based plant. Twelve different Honda and Acura models are built at five Honda auto plants located in the U.S.
Honda established operations in America in 1959 and today employs more than 40,000 associates in the development, manufacturing, and sales of Honda and Acura automobiles, Honda power equipment Honda powersports products, the HondaJet advanced light jet and GE Honda HF120 turbofan engines. Based on its longstanding commitment to “build products close to the customer,” Honda operates 19 major manufacturing facilities in North America, working with more than 650 suppliers in the region to produce a diverse range of products for customers locally and globally. In 2017 more than 90 percent of the Honda and Acura automobiles sold in the U.S. were produced in North America, using domestic and globally sourced parts. Honda also operates 14 major research and development centers in the U.S. with the capacity to fully design, develop and engineer many of the products Honda produces in North America.